The liquid starch you can find it at your local grocery store with the laundry detergent or you can purchase on amazon. 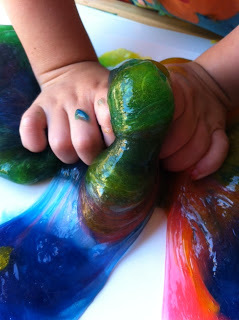 You mix it all together, separate the slime into a few small bowls and add food coloring to each bowl. You only need a few drops of food coloring!!! The mixture may need to be mixed with your hands for a bit to get the desired texture, depending on the brand of glue you use.